Why is that art? Why is it in an art museum? Who says it's art? Why is it good? 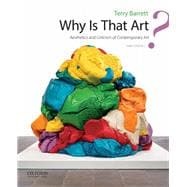 Why Is That Art?, Third Edition, introduces students to theories of art through the presentation of contemporary works that include abstract and representational painting, animated film, monumental sculpture, performance art, photographs, relational art, and video installations. Ideal for courses in aesthetics, art theory, art criticism, and the philosophy of art, this unique book provides students with a newfound appreciation for contemporary art, scholarship, and reasoned argumentation. Terry Barrett is Professor Emeritus at The Ohio State University and former Professor of Art History and Art Education at the University of North Texas.